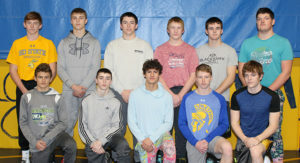 The WSWWW varsity wrestlers this year are pictured back row, left to right: Camden Jost, Landon Wolter, Rylie Stevens, Brock Stevens, Tyler Eddy and Henry Eichstadt; front row: Keegan Haider, Joey Hoverson, Tate Haider, Carter Grohs and Seth Tebay. 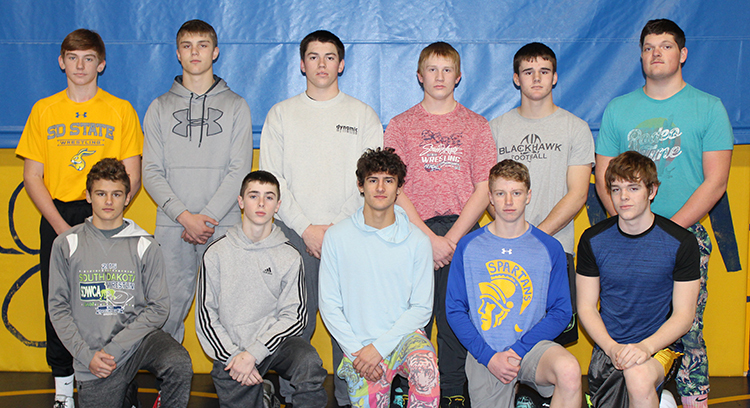 This year’s Blackhawk wrestling team has added Wolsey-Wessington to the co-op. The Wolsey-Wessington Warbirds are wrestling wearing their singlets and the Blackhawks are wearing theirs, but they are all still one team. In their first action of the season, they traveled to Gregory for the Gregory Invitational. There were 13 teams participating and WSWWW ended in fourth place as a team. Their next action was a triangular in Highmore with WSWWW sweeping the competition. They beat Sunshine Bible Academy 54-22, and they conquered Miller/Highmore-Harrold 63-18. This past weekend WSWWW traveled to Plankinton for the MVPCS Tournament. There were 18 teams involved, and WSWWW earned fourth place against some tough competition. Next up for the wrestlers is the McCook Central Tournament in Salem on Saturday, Dec. 22. …Read details about the tournaments in this week’s issue of the Sanborn Weekly Journal!